I first created a Goodreads account in 2011, but this year have used it more actively. My plan was to follow the Book Riot Read Harder Challenge for 2015, but I lost track of it. So many books, so little time. But I will try again with the 2016 Challenge! I used to track books I read in a little notebook that eventually ran out of pages. I decided that Goodreads would be a better place for this information, and abandoned the notebook to go digital. Goodreads tracks the amount of books and pages I read, plus maintains a list of books I want to read. I challenge myself to write a review of each book I finish to keep my writing skills sharp. According to Goodreads, I read 35 books this year (beating the goal of 33 I set for myself) and 8,559 pages. As a stats nerd, this information is fun for me. In this post I will write about some of my favorite books I’ve read this year from my Goodreads list. What stuck out to me most about The Art of Asking by artist, creator of a wildly successful Kickstarter campaign, and TED presenter Amanda Palmer was her loyalty to her fans and her focus on connecting with them. She collected email addresses and built a list before email marketing was even a practice, and she wouldn’t share the information with a major label that signed her. I now count myself among Palmer’s fans, as I admire her dedication to them. I listened to the audiobook available on eBCCLS, which is read by Amanda and features musical performances. This is a short book (also an eBook on eBCCLS) that transcribes Adichie’s TED Talk of the same name, which was sampled in Beyonce’s track “***Flawless”. I read it while waiting to board a flight last winter, and was so inspired by this accessible explanation of feminism. I’ve long identified as a feminist (fun fact: we don’t hate men!) 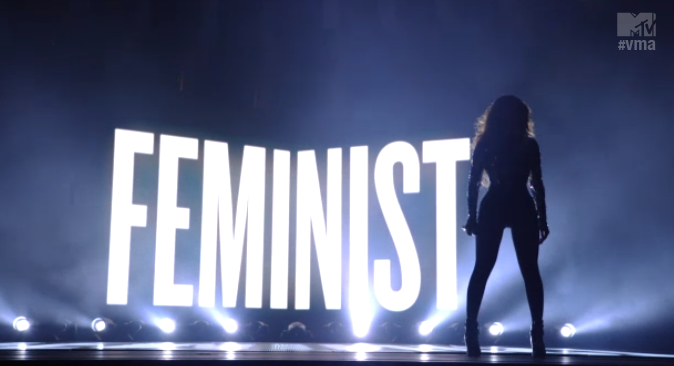 but it’s great to see the movement, and Adichie’s talk, embraced by someone as influential as Beyonce. (Remember this?) Everyone should read We Should All Be Feminists, and then explore Adichie’s body of work. This graphic novelization of the 9/11 Commission’s report on the worst act of terrorism in the United States should be required reading for anyone that wants to understand the events leading up to September 11, 2001. I learned a great deal about Middle Eastern history and the rise of Al Qaeda from this book. The world has changed immensely since 2001, with ISIS as the new threat, but I feel that reading the 9/11 Report, either in text form, audiobook from eBCCLS, or the graphic novel, is more important than ever. Modern Romance, with all its research, focus groups, and statistics could have been boring (unless you love stats like I do), but Aziz Ansari’s intelligence and humor made this book thoroughly enjoyable. One of his points (that I agree with as someone that’s been using online dating platforms for several years) is that online dating has given people too many choices, which can almost be paralyzing. After reading this book (as an eBook through the 3M Cloud Library or eLibraryNJ, or an audiobook through eBCCLS or eLibraryNJ), you will have learned a lot and laughed a lot about dating in the digital age, where men and women equally obsess over how long it takes for a potential date to respond to a text message. As you may have gathered from this list so far, I prefer reading nonfiction. But the Mile Square City Readers Book Club that I co-run at the library compels me to read more fiction than I would choose on my own. I liked The Knockoff (the group’s September choice) a lot as someone that has long loved reading fashion magazines. My favorite part was figuring out the real-life inspirations for certain characters featured in the book. This title is available as an eBook and audiobook in eBCCLS, and as an eBook in eLibraryNJ. This book is a game-changer. I have followed Kondo’s advice about folding my clothes, and my dresser has never been so organized. I have to restrain myself from showing houseguests how neat my sock drawer looks. Luckily a good friend has read the book, too, so we talk about how we use the KonMari method in our homes. Kondo feels the objects in our home should “spark joy”, which makes sense to me. I still have a lot of work to do (the notion of going through my papers is frightening) but I am pleased with the results thus far. If you enjoy organizing and rearranging your space, you will like this book. eBooks and audiobooks are available in both eLibraryNJ and eBCCLS, and Hoopla Digital has an audiobook. What books have you loved in 2015? Are you on Goodreads? Cheers to reading great books in 2016!